The world's largest filled single-dish radio telescope launched on Sunday, and it relies on a piece of West Australian innovation. The telescope—known as FAST—uses a data system developed at the International Centre for Radio Astronomy (ICRAR) in Perth and the European Southern Observatory to manage the huge amounts of data it generates. The software is called the Next Generation Archive System (NGAS), and will help astronomers using the telescope to search for rotating neutron stars and look for signs of extra-terrestrial life. 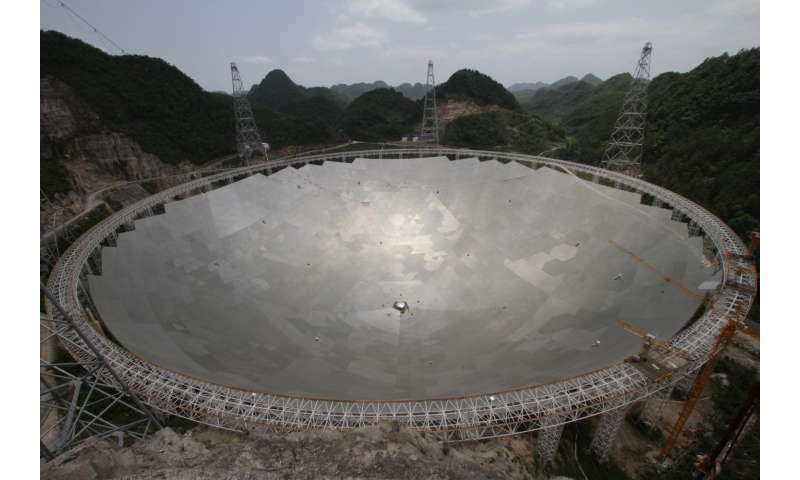 FAST, or the Five hundred meter Aperture Spherical Telescope, is so large it had to be built into a valley in Guizhou province in south-west China. The NGAS data system will help to collect, transport and store about three petabytes of information a year from the telescope. "That's a hundred thousand 32GB iPods filled every year," said Professor Andreas Wicenec, who heads up ICRAR's ICT program and helped design the data system. "Getting that kind of capacity is not too hard anymore but the main challenge is transporting so much data and having the network bandwidth to move it around." FAST will be one of the most sensitive telescopes ever built, and the huge amounts of data produced will allow astronomers to map hydrogen gas in the Milky Way, hunt for rotating neutron stars known as pulsars and look for signals from extraterrestrial intelligence. It is an official pathfinder to the multi-billion dollar Square Kilometre Array (SKA) telescope, to be built in Western Australia and South Africa. Professor Wicenec says China marks the latest conquest for the NGAS data system, which is already used on telescopes including the European Southern Observatory, the US National Radio Astronomy Observatory and the Murchison Widefield Array in outback Western Australia. "For us it's quite exciting to install NGAS on yet another telescope because the system is now being used all around the world," he said. "China is one of the few regions we hadn't covered yet."